Arsenal manager Unai Emery has admitted that the club may spend on a new central defender in the New Year with Rob Holding sidelined for the rest of the season with a serious knee injury. 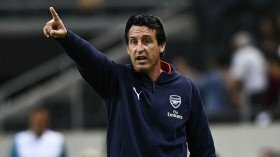 In a report covered by Sky Sports, Emery acknowledged that the Gunners may consider bolstering the heart of the defence in the forthcoming transfer window, should they find a 'good option' available. "I think if we can take one player to help us at centre-back, I think it's a good option. The transfer (window) is not easy," he is quoted as saying by Sky Sports. Laurent Koscielny made a much-awaited comeback from an Achilles injury during the recent 1-0 Europa League win over Qarabag and the Frenchman should provide a much-needed boost for the weekend. The Gunners are already with Shkodran Mustafi and Sokratis Papastathopoulos after domestic suspensions and Emery may field Koscielny and Nacho Monreal in the central defence when the Gunners make the league trip to Southampton this weekend.